A Bloomsday night entertainment hosted by Pope Lonergan. My new show for 2019 is "World of Sports". I'll be performing it at the Edinburgh Festival Fringe 12–25 August. Venue: Heroes @ Dragonfly. Time: 6pm. I will be supplying a short stunt for "The School of Ken: What I Learned from Ken Campbell", part of a day of celebrations at the British Library. Alex Finch has listed me among his "favourite ever comedy gigs" on the Comedy to Watch blog. Time Out London has listed The Great Fire of London among its "Nine Best Gigs" for August. The Independent names me among "the very best acts in comedy" who are not bringing shows to Edinburgh this year. Tickets for Michael Brunstrom: The Great Fire of London at Camden Fringe Festival are now on sale. 31 July–3 August, 9.30pm, The Albany. FLIM NITE have invited me to interpret a segment of Harry Potter and the Philosopher's Stone at their splendid variety event in Sheffield (Friday 1 June) and Manchester (Monday 4 June). My poster for The Great Fire of London has been nominated for "Best Poster" at the Leicester Comedy Festival. This is the third year in a row that my poster has been nominated for this award. I'm preparing a brand new show for Leicester Comedy Festival in February 2018: Michael Brunström: The Great Fire of London. On Saturday 14 October, I will be donning my skates to take part in an epic alternative comedy caper at Alexandra Palace Ice Rink. Tony Law and Friends in The Battle for Icetopia stars Tony Law, is written and directed by Adam Larter and is a joint Weirdos/Heroes production, with a cast including Joz Norris, Ali Brice, Elf Lyons, Marny Godden, Ben Target, Helen Duff and Matt Highton. My poster for Parsley, which won Best Poster at the Leicester Comedy Festival, has attracted attention at the Edinburgh Fringe too, especially with the daily addition of fresh springs of parsley. The adorable comedy critic Fringe Dog has awarded me a Fringe Terrier Award for "Best Poster to See with only 2 Color Cones in your Eyes", and the British Comedy Guide have included it in their Edinburgh Fringe Extra roundup. A lovely review of Parsley from Kate Copstick in The Scotsman. "Brunström's shows are things of beauty and love." Read the whole thing here. Laugh Out London have included me among their "21 Sketch/Character/Clown recomendations for the Edinburgh Fringe 2017": "A truly unique performer". Steve Bennett of Chortle wrote a review of the Heroes of Fringe Launch Show at Soho Theatre on 12 June. He described my act as "enduring, and very silly". Read it here. Tickets for my 2017 Edinburgh Fringe show Parsley are now on sale. Pleased to announce I will be playing 'Nigel Masters', a new character in Dave Pickering and J. Adamthwaite's improvised fantasy sci-fi family drama podcast, The Family Tree. Catch up with Season 1. My poster for Parsley has won Best Poster at this year's Leicester Comedy Festival. Thank you to everyone who voted. On 10 March I am the honoured guest (the honour is mine) of the Silly Billies. Alongside their high jinx, I will perform an hour of old and new material at the Alphabetti Theatre, Newcastle. Tickets can be got here. Double Act, the short film I acted in alongside Ed Aczel and Gabby Best, will be shown as warm-up to the World Premiere of Joz Norris' and Matt Highton's new film The Devil & Robert Johnson at Hackney Picturehouse Attic on 3 March. The night will also feature live perormances from both films' stars, incuding me. For the second year in a row, my poster has been shortlisted for Best Poster at the Leicester Comedy Festival. You can see all the shortlisted posters and vote (for mine) here. On 24 February, I am proud to be appearing at Beckenham Comedy Cabaret, with Earl Okin, Paul F. Taylor, Jo Neary and Jody Kamali. I'll be previewing a very early version of this year's show Parsley at 'Dr Penny's Cabainet of Curiosities', a weekend festival of alternative comedy at Mozart's in Uplands, Swansea, 21–22 January. Also featuring Adam Later, Mark Dean Quinn, Lucy Pearman, Northern Power Blouse, Eleanor Morton, Ben Target, Joz Norris, Phil Jarvis, Andy Barr, Marny Godden, The Death Hilarious, Ali Brice and Noel James. It's time for this year's Weirdos Christmas Pantomime. My Big Fat Weirdos Christmas Wedding runs from Wednesday 7th to Friday 9th December at Leicester Square Theatre. It stars a plethora of alternative comedy talents and will be raising money for Great Ormond Street Hospital. Tickets can be had here. The first helping of the Weirdos' new web series A Load of Croc is out. I play Dorito Fish. This episode also stars William Lee, Ben Target, Beth Vyse, Mark Stephenson, Lucy Pearman and Christian Brighty. Written by Adam Larter. Directed by Matthew Highton. Shot and edited by Stuart Laws. Produced by Turtle Canyon Comedy. Two more episodes to come! I've written a little piece for Laugh Out London about how easy it is to be original. Read it here. I will be previewing a brand new show at the Leicester Comedy Festival in February. It will be called Michael Brunström: Parsley. I have created a new page where you can read all my reviews in full. HERE. ★★★★! Kate Copstick in The Scotsman says of The Hay Wain Reloaded: "Go for the great merchandise, go for the marvellous classical music, go for a game of beachball. But most of all go for some great, crazy, never to be forgotten comedy." ★★★★! Another review of The Hay Wain Reloaded: Polly Glynn of The Skinny uses phrases such as "curious and captivating", "artistic genius" and "charming". Read it here. ★★★! The first review of The Hay Wain Reloaded has been published. Steve Bennett of Chortle uses phrases such as "hilariously silly", "plenty of laughs" and "visionary artist". Read it here. You can hear my voice in the Weirdos' latest project: radio sitcom Jalapeño High, scripted by Adam Larter, starring Harriet Kemsley, John Kearns, Pat Cahill, Katia Kvinge and many, many others. I'm proud to be in Double Act, a short film starring Ed Aczel, Gabby Best and myself. Script by Joz Norris. Directed by Matt Highton. Shot and edited by Stuart Laws and Turtle Canyon Comedy. Michael Brunström: The Hay Wain Reloaded has been listed among the Top 15 Pay-What-You Want Shows at this year's Edinburgh Fringe. You can read a cosy promotional chat I had with the lovely people at Laugh Out London here. I will be reprising my role as Dorito Fish in a forthcoming set of three Weirdos Shorts, produced by Turtle Canyon Comedy. Limited-edition Hay Wain Beach Balls, to promote my new show The Hay Wain Reloaded, are now available. Click here to order yours. The Phoenix Remix has listed The Hay Wain Reloaded among its top Edinburgh Fringe comedy shows in the 'painting, horror and historical' category. I have just finished acting in my very first short film, Double Act, written by Joz Norris, directed by Matthew Highton, and produced by Stuart Laws for Turtle Canyon Comedy. It also stars Ed Aczel and Gabby Best and I can't wait for you to see it. 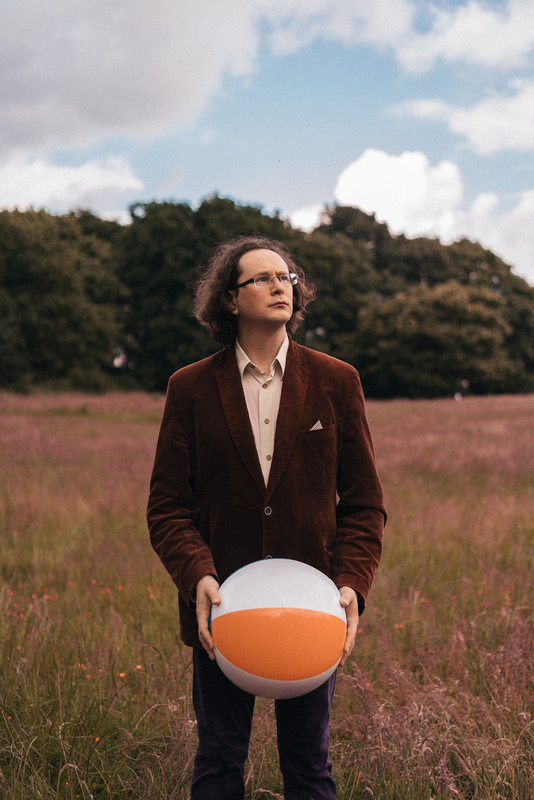 Michael Brunström: The Hay Wain Reloaded is headed for the Edinburgh Festival this August as part of Heroes of Fringe: 6pm, 4–13 August, Heroes @ Dragonfly. Look at my GIGS page for up-to-date details on previews, etc. My design for The Hay Wain Reloaded has been nominated for best poster at the Dave's Leicester Comedy Festival Awards. A very pleasant conversation I recently had with Dave Pickering has been published on the Getting Better Acquainted podcast. I will be performing my new show The Hay Wain Reloaded at the Bath Comedy Festival on Saturday 2 April. Buy tickets here. I will be in Swansea on Saturday 16 January, taking part in Dr Penny's Cabinet of Curiosities, a day-long festival of alternative comedy, alongside Joz Norris, Phil Jarvis, Cassie Atkinson, Ben Target, Eleanor Morton and Adam Larter. I have been interviewed by The Peckham Perpendicular, the organ of Pull The Other One, ahead of my gig with them on Friday 27 November. John Fleming has published an interview with me on his blog. I talk about my approach to comedy, what I want to do next and a few other things. Read it here. In February 2016, I will be returning to Dave's Leicester Comedy Festival, with a new show full of things. It will be called The Hay Wain Reloaded. I am chuffed to bits to have won the 2015 Malcolm Hardee Award for Comic Originality. I have been nominated again for the increasingly prestigious Malcolm Hardee Award for Comic Originality. I will be performing an hour of stuff in Bob's BlunderBus at the Nottingham Comedy Festival, on Friday 13th November. 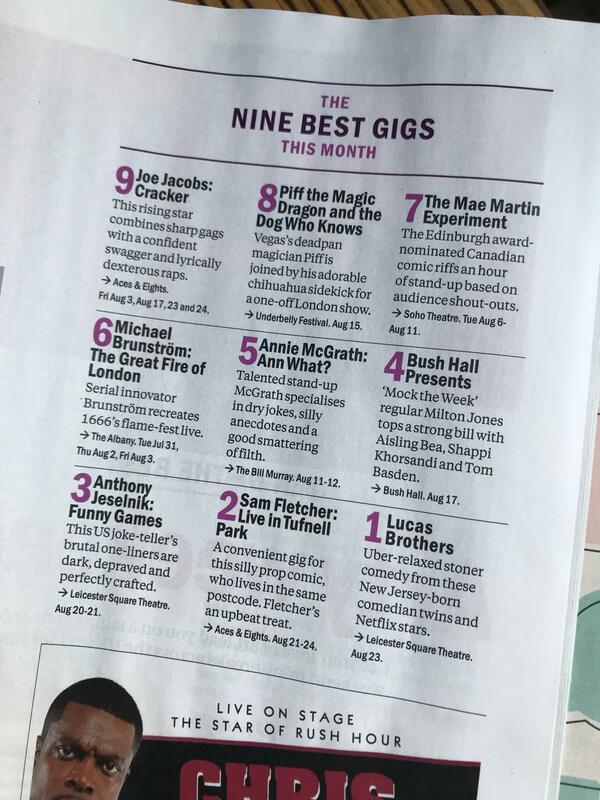 Previews of The Golden Age of Steam are the 10th "most popular" comedy show in London, according to Time Out. The Golden Age of Steam is one of Laugh Out London's 20 free comedy recommendations for the Edinburgh Fringe 2015. Laugh Out London have published my five 'unfunny inspirations'. I am pleased to announce that my Edinburgh Fringe show, The Golden Age of Steam, will now take place at Heroes @ The Hive, at 16:10, 18–23 August. I will be bringing a new show, titled The Golden Age of Steam, to the Edinburgh Festival Fringe in 2015. Putting in appearance at Dave's Leicester Comedy Festival in February 2015, alongside iconoclastic art-yeti, Phil Jarvis. Hugely honoured to be kicking off the Discordian Papal Ball, part of the Find the Others Conferestival accompanying the premiere of the stage adaptation of Robert Anton Wilson's Cosmic Trigger, by Daisy Eris Campbell in Liverpool on November 22/3. I'm one of the comics featured in ‘Behind the Fringe' 2014 – a collection of photographs by writer and director Nicholas Collett. I have been nominated for the increasingly prestigious Malcolm Hardee Award for Comic Originality. Laugh Out London has listed the Human Loire as one of the ‘best free comedy shows at the Edinburgh Festival Fringe 2014’ – ‘be prepared for the unusual’. Chortle has listed the Human Loire as one of the ‘ten weirdest acts heading to the Edinburgh Fringe’.